A good banding wheel can help you at every stage of your projects, from construction through glazing and adding those last decorative touches. You can see your piece from every angle, or give it a spin to add smooth, even, consistent bands of color all the way around. Like with brushes, we recommend that you get the best banding wheel you can afford as an investment in your art. With a little care, a good one will give many years of service. Laguna listened to your comments about banding wheels and took your ideas to heart. The result? 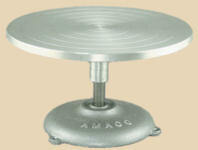 Custom-designed, reasonably priced banding wheels of superb quality and cast steel construction. Give one a spin! Shimpo banding wheels are designed to give reliable, smooth rotation at any speed for even the most delicate projects. Five models offer a selection of heights and diameters. 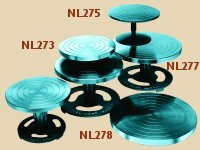 Economical alternatives to the more expensive banding wheels, these turntables offer wooden bases and top plates mounted on bearing rings. The top surfaces are sealed, but not the sides. We recommend guarding against allowing water to soak into them.